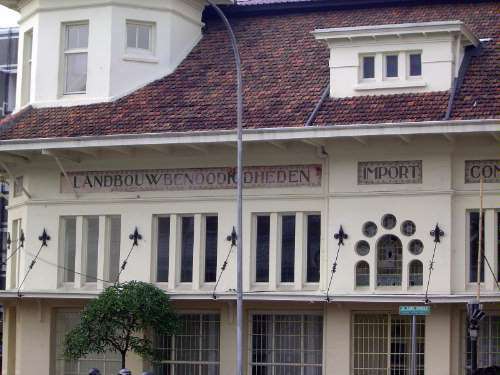 Tired of the lowland heat of Batavia, the Dutch in the 1920s revived a 19th century plan to move their capital inland and 70 miles southeast to Bandung. 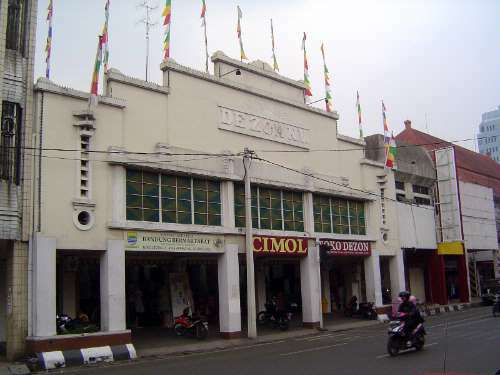 That city--spelled Bandoeng by the Dutch--sits at 2,500 feet above sea level. 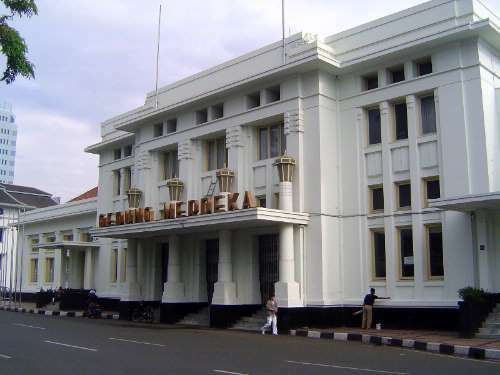 A Dutch travel guide from 1930 describes it as "verily a terrestrial paradise--its climate is delightful--its two large, first class hotels, and its exceptional surroundings, all contribute to make Bandoeng an ideal spot for tourists to linger in. 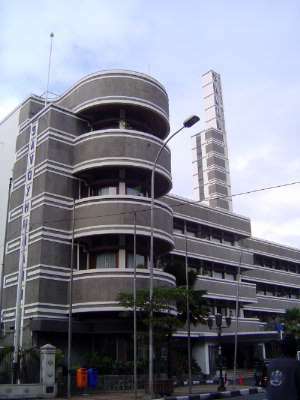 It is inconceivable to the foreigner that there should be any hesitance on the Government's part to transfer its headquarters from hot Batavia to cool and healthy Bandoeng." (S.A. Reitsma, Van Stockum's Travellers' Handbook for the Dutch East Indies, 1930, p. 192.) World War II intervened, and the move never occurred. 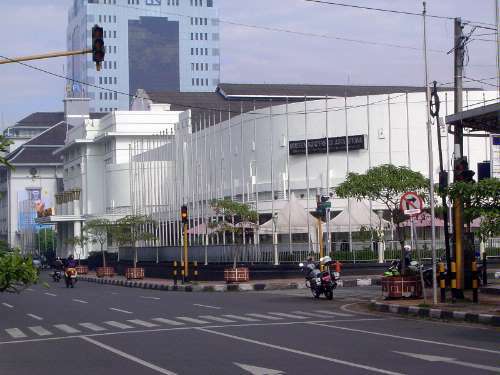 Still, Bandung was by then a good-sized town, proud of its stylish architecture and on the eve of hosting perhaps the most important Cold War conference ever held by the non-aligned nations. 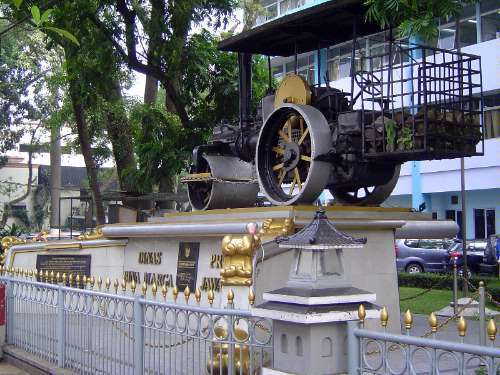 The energetic Herman Willem Daendels, Governor-General of the Dutch East Indies from 1808 to 1811, had ordered the construction of Die Groete Postweg, the "great post way," a highway traversing Java and recalled by this roadside monument. The road is now called Jalan Asia-Afrika in memory of the conference. 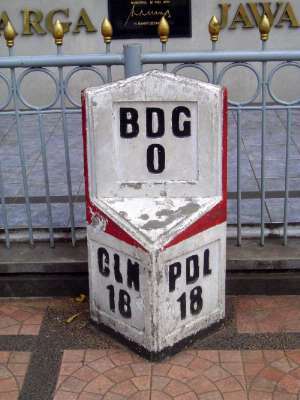 Mileposts on the road were numbered starting at Bandung. 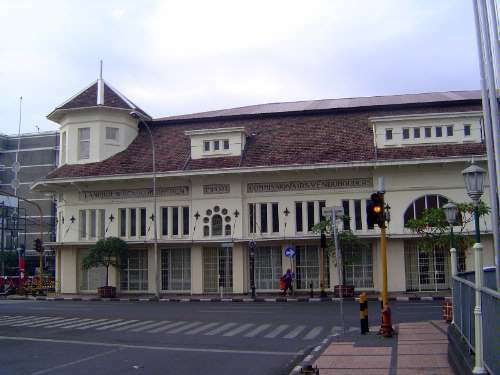 Rapid growth of the city, however, began only after the railroad from Batavia (now Jakarta) arrived in 1884. 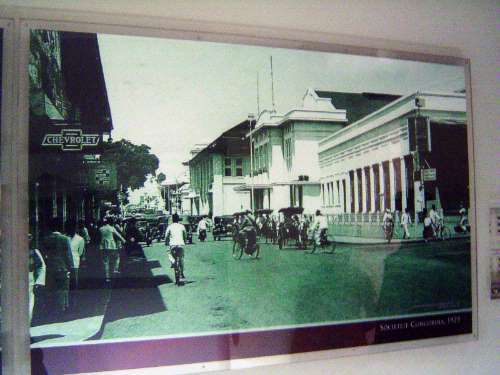 By 1920 Bandung had 90,000 residents, including 10,000 Europeans. Ten years later it had 157,000, including 18,000 Europeans. 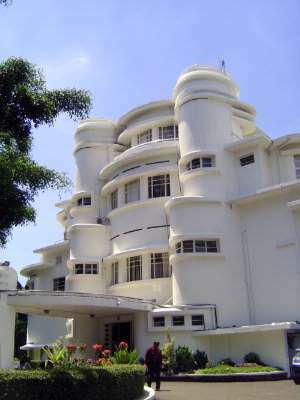 The social hub of the Dutch community was the Concordia Club of 1921, designed by Charles Wolff Schoemaker (1882-1949), an architect born in Bandung and creator of some of its most distinctive buildings. Schoemaker's career has been treated at length by C.P. van Dullemen in Tropical Modernity: Life and Work of C.P. Wolff Schoemaker, 2010. Perhaps the most striking quotation in that book comes from Sukarno, who was a student of Schoemaker at the East Indian Technical University (now the Bandung Institute of Technology). 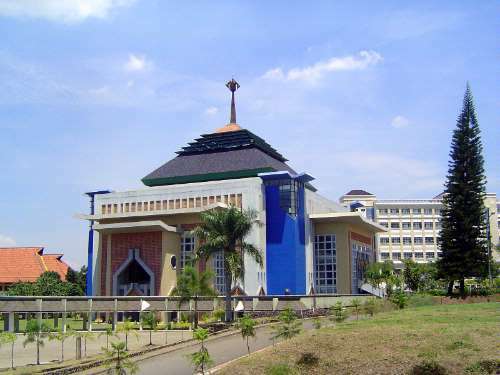 Sukarno wrote (p. 159), "Professor Wolff Schoemaker was a great man. For him there was no difference between whites and non-whites. For him there were no Dutch or Indonesians. No free men or slaves. All that mattered for him was what a person could do." 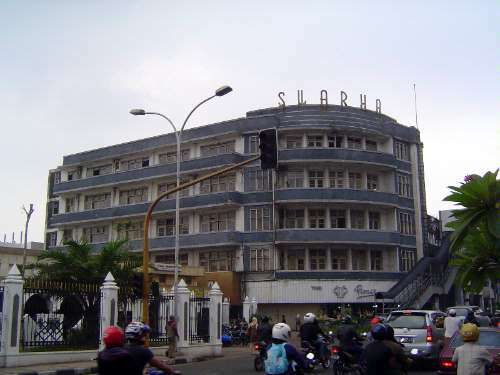 Sukarno's friendship cost Schoemaker dearly in the years just after World War II, when the Dutch saw Sukarno as a terrorist. A daylight view of the Club in 1925. Schoemaker, by the way, converted to Islam, made the hajj in 1938, and was eerily prescient about the role Islam might play in the future of Indonesia. He wrote to Sukarno in 1948 and asked him to consider creating a sultanate. "Democracy," Schoemaker wrote, "on a Western foundation is simply inappropriate for this people of different groups, the majority still culturally and politically backward, as well as being in conflict with the Islamic tradition" (van Dullemen, p. 45). 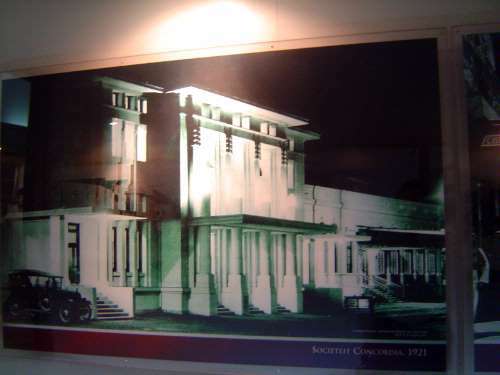 A historic photograph of the club's east wing. 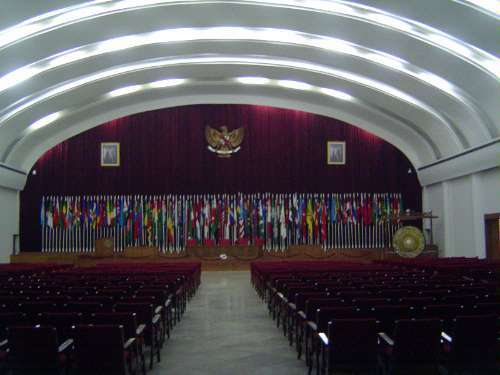 It was in this building that Sukarno held the Asian-African Conference in April, 1955, attended by 19 nations, including India represented by Nehru and Egypt represented by Nasser. 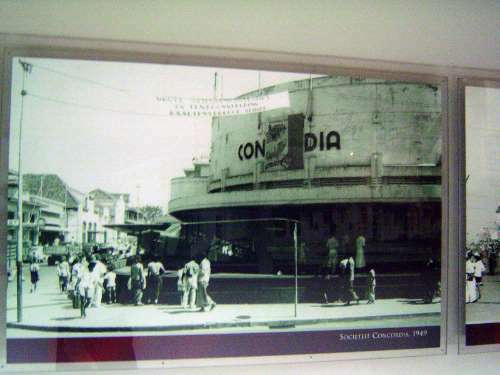 The Concordia Club was then renamed the Gedung Merdeka, Independence Hall. 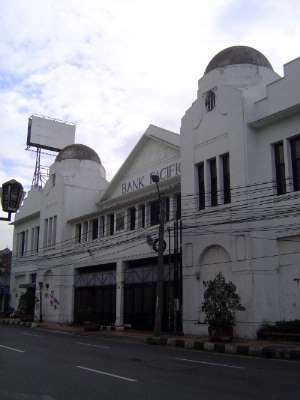 Several changes were made in the facade, with the roofline flattened and the original, bullet-shaped lanterns replaced. At either end of the central parapet Schoemaker placed makaras, mythological creatures common across Southeast Asia. They are barely visible here, especially because they no longer are painted in a contrasting color. 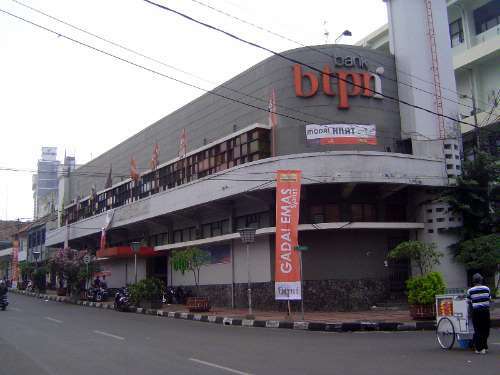 Here's the facade in 2011. 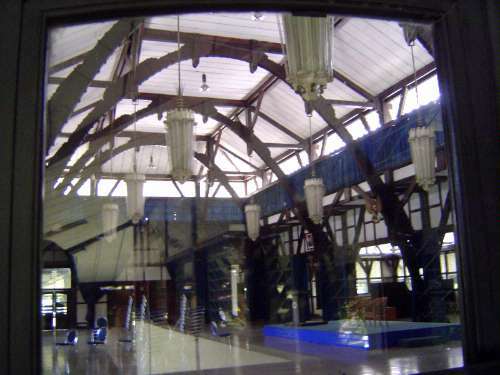 The roof of the main hall rises in the background. 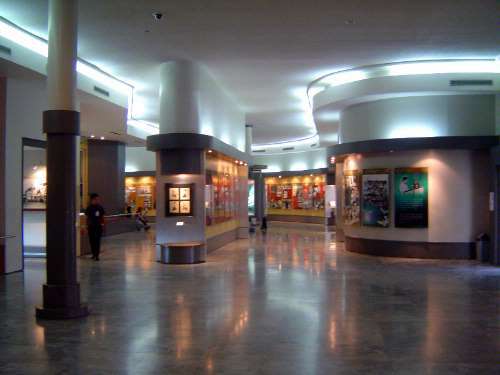 Here is the inside of the hall, preserved as a museum. It seats 1,200 and once saw a performance by Anna Pavlova. The arches, load-bearing, are of wood. The startling east wing is also part of the conference museum. Curvature like this will appear even more dramatically in the Villa Isola, Schoemaker's masterpiece. Across the street is this much more conventional building, a kind of general store. A block to the east, Schoemaker designed a hotel, the Preanger, which opened in 1927 and is still in business, now as the Grand Preanger. The conference staff stayed here. 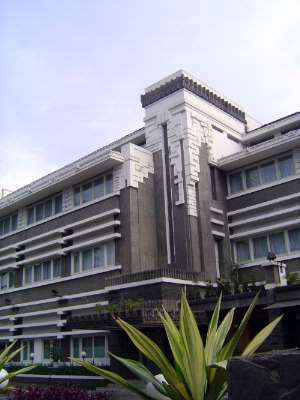 Facing it was the Savoy Homann Hotel, built in 1935 and designed by A.F. Aalbers. The politicians put up here during the conference. And here, in the Swarha Hotel, abandoned by the time this photo was taken in 2011, a great many journalists stayed, including Richard Wright, who wrote about the conference at length. Jalan Asia-Afrika is a river of traffic. 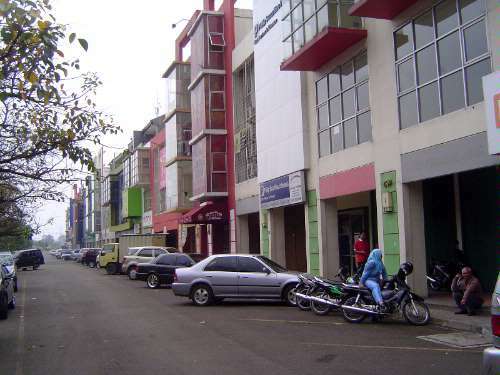 Running perpendicular to the old post road is Jalan Braga. Here, along this street, is the New Majestic Restaurant, originally the Majestic Theater, 1922, another Schoemaker project. Barely visible at this angle, there's the head of a red-tongued kala monster between the awnings. 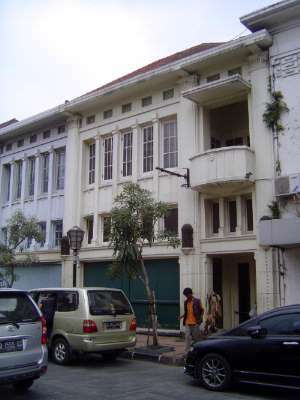 Another, this one on Jalan Tamblong. 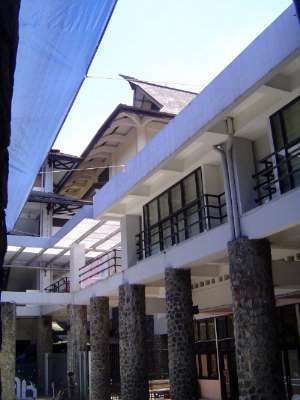 A lineup of office buildings on Jalan Braga. 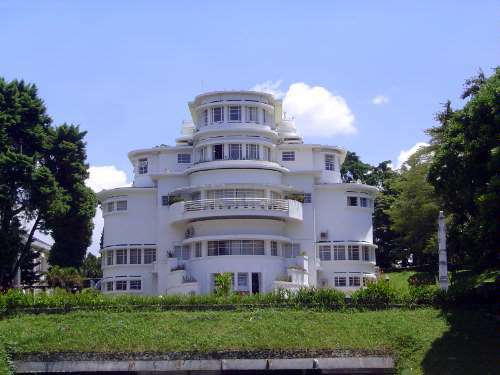 The prize goes to Villa Isola, designed by Schoemaker as a house for Dominic Willem Berretty (1890-1934), director of the Aneta press agency. A journalist who knew him personally said, "His ambitions culminated in the building of that monument of rashness in the Lembangweg: Villa Isola, which almost reduced him to beggary" (p. 136). His financial problems didn't last long, because Berretty died in a plane crash a year after the building's completion. Despite appearing to be made of concrete, construction photos show that the Villa Isola was actually a steel-framed building with light-weight stone walls. Schoemaker's drawings are no help, because they were burned when his own house was destroyed in the troubled years after World War II. The building, van Dullemen points out, bears a very strong resemblance to the impressionistic sketch drawn by Erich Mendelsohn in 1921 and called Toccata in D major. A stronger inspiration, van Dullemen writes, probably came from Hollywood movie sets. Literally the "island house," Villa Isola appears in aerial photographs from the 1930s as standing like an island in large gardens fringed by rice paddies (see van Dullemen, p. 137). Why the Italian name? Because though Beretty's mother was Javanese, his father was Franco-Italian. 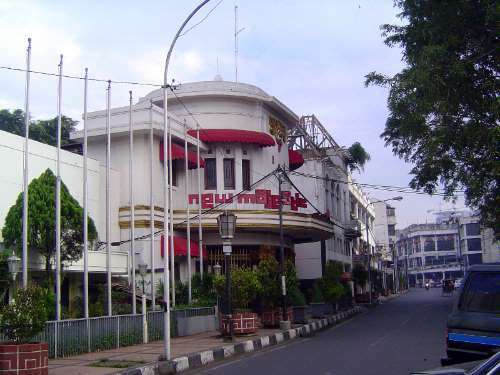 After his death the building became a part of the Savoy-Homann hotel, although that hotel is several miles away. 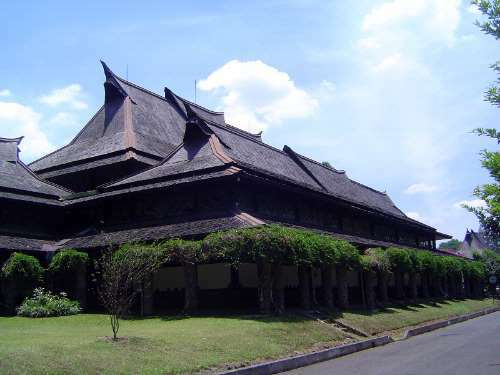 During the war the house was badly damaged but restored after 1948, when it became the headquarters of the Siliwangi division of the Indonesian Army. 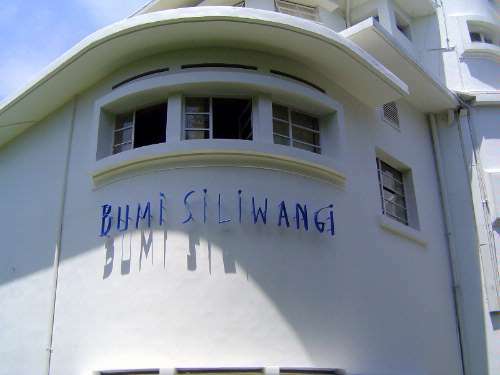 Hence the surviving label Bumi Siliwangi, "Siliwangi Place." 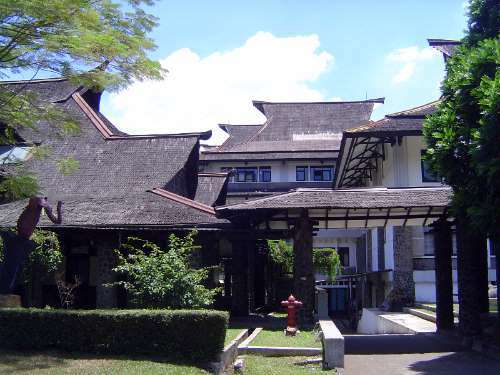 Today the Villa Isola sits on the campus of a teacher's training college, whose buildings revert to the iconic meru, a roof form used in Balinese temples and frequently encountered in modern construction. 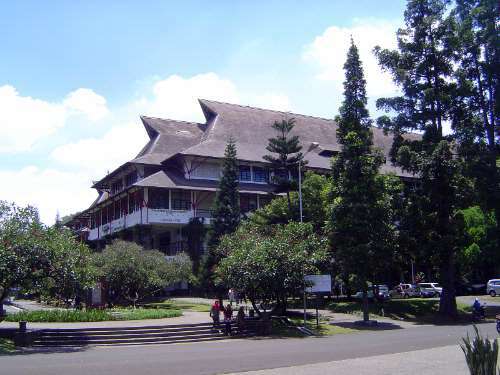 A much grander example: the West Hall of the Bandung Technical University, built in the Sumatran style, 1918-20. Under the traditional roof, astonishingly, there are non-traditional supports of wood formed into parabolic arches. The architect was H. MacLaine Pont. He was often engaged in polemical battles with Schoemaker. Maclane believed that modern architects could adopt traditional styles, while Schoemaker maintained that "Java does not have an architecture as we understand the term" (p. 60). Schoemaker appears to have believed that India, however, particularly in its Hindu temple forms, did possess an architecture adaptable to the present day. "Indo-European architects," he wrote, "must study the Indian works in depth, as our first rationalists studied medieval buildings, if they are to grasp the essence of this art and to find new impulses in it" (p. 159). Neither man won the debate, and van Dullemen writes that Pont "never received another new commission and he devoted the rest of his life to archaeological research on the East Javanese Majapahit empire" (p. 154). Here's the East Hall, which looks similar but isn't. We can find a way in. 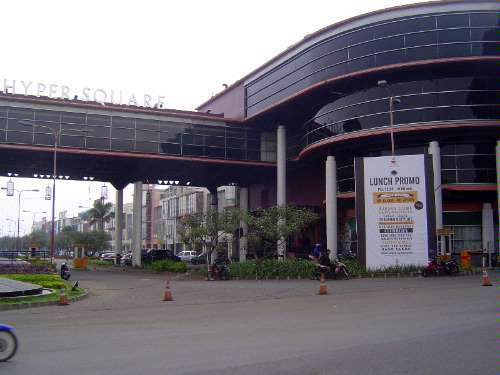 Meanwhile, Bandung continues to grow, here with a huge commercial center built on a railroad right-of-way. At first it looks like a conventional shopping center, but it's actually traditional, with stores downstairs and office quarters above. Instead of the shophouses so characteristic of Singapore, here we have shopoffices, so-called.